Learning about healing and homeopathy for me can come in interesting places. 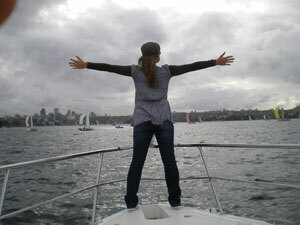 Last weekend we had the opportunity to be out on a boat on Sydney harbour. The kids with us suggested we have a ‘Titanic’ moment (ie – standing on thebow of the boat witharms spread out!) while the boat was moving through the water. It was this game that really got me thinking and I would like to sharethese thoughts with you. When it was my turn to have my own ‘Titanic’ moment I found that I had to initially brace my legs hard to prevent tumbling into the wintry sea below; but after a few seconds it was clear to me that if I just allowed the unpredictable movement of the boat to flow through my body, then I was simultaneously more ‘fluid’ and more stable. Notice that I use the words “allowing” and “unpredictable” as it is important that you bear this in mind as you read on. What role does ‘allowing’ play in our health/ill-health? It has always been my belief as a holistic health practitioner that our unconscious self plays a significant part in our health and well-being. When patients come to me for treatment they heal as a response to a combination of my homeopathic prescribing, the permission they give themsleves to change, and their willingness on all levels to heal. You may or may not be aware of Byron Katie’s work but here is a link to an interesting and moving video, where a man with cancer finds 4 ways in which he doesn’t want his cancer to go away because at many levels it has enriched his life and it ‘serves’ him in an amazing way. At a smaller and seemingly more trivial level, think about the last time you were laid up with flu or a bad cold. If you had to take time off from work or your normal life it is likely this illness served you in some way by either creating some time-out so you could gain another perspective, or providing you with a break from dealing with the pressures of daily life. When we resist, we create emotional and mental drama, and on a physical level, ill-health; and when we ‘allow’, we say something very positive to the world about our ability to incorporate change and the unpredictability of life. So how can we use this concept to be more healthy? The trick is to first accept and understand that disease is mostly because we have either a physical, emotional or mental suspectibility to it at that time, rather than because we ‘caught’ it. If the presence of pathogens were the only cause of disease then we would all get the same illnesses! Secondly, once we have really understood that we have an active role in our own disease creation process, we can also accept we can take an active role in our own healing. On a practical level this may be looking after ourselves physically and on an emotional level this is about allowing healing by paying attention to those things that need attention in our lives. Acceptance of our disease state ====> Responsibility for our self and disease ====> Allowing healing for ourselves! It is amazing how empowering just knowing (and understanding it at a heart level), this concept can be. Homeopathic treatment fosters this kind of self awareness as it treats you on all levels and encourages self responsibility. This in turn creates awareness for new possibilities on the physical, mental and emotional levels. It is just like my titanic moment on the boat. As soon as I allowed myself to trust in my own ability to take care of myself through the unpredictability of the boat’s motion through the water, I felt strong, stable and enabled. Willow has a ‘titanic’ momentWhen Willow who is only 4 wanted to do the same, I held onto her little legs as I really didn’t want her to fall overboard, but she was brave enough, and wanted it enough, to let go of me and flung her arms out wide and felt the wind on her face. She trusted that I would be her stability, and as she grows she will find out that she can be her own safe pair of hands. Isn’t it about time that you became your own safe pair of hands? Have you had a health titanic moment? If you want some homeopathic support for your new found state of ‘allowing’, OR help to get yourself there, book a skype online consultation with me and let’s get to work! Hi Amy, Thanks for your continued atetitnon and promotion of homeopathy. I have been a homeopath for 12 years now and have written a book which is now an E-Book called Homeopathy: A Manual For Mothers available on my website. I did this because most of the family homeopathy books are really very difficult to understand for the average layperson. The National Center for Homeopathy kindly did a review of the book in the Winter 2011 Homeopathy Today. My passion is to help moms learn how to use homeopathy in the natural care of their children for common childhood illnesses. The book also advises new moms how to use homeopathy for healing after childbirth and with lactation and the post partum blues. Am telling you about the book in hopes that you might consider posting my info as a resource for your wide audience of mothers. So happy homeopathy helped you with your son. best regards, Janee Niebler.